This year was the 40th F.G.A. annual show! 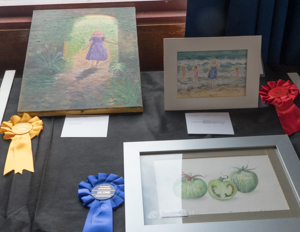 We put up the banners and balloons and had some special raffle prizes to celebrate. One of our cookery classes was also "An anniversary cake". 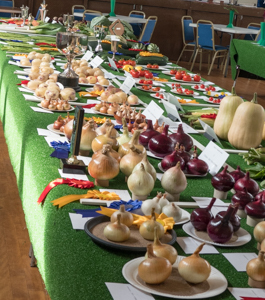 Whilst we might not have had as many entries as our near record breaking year last year, the hall was full of some high quality items and there were very few classes which didn't have at least one entry. 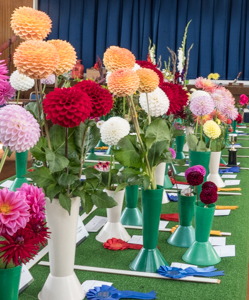 Both the judges and the people looking around the show commented on how good the show was and I'm pleased to say that our shows do not seem to be in danger of disappearing, as has happened to a number of other villages / towns. 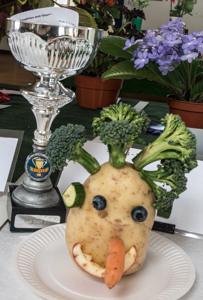 This year we did get some entries in the novice vegetable and flower classes but it would be great to get even more next year, and it would also be nice to get some more entries in the children's classes (which is open to children and grand-children of members). 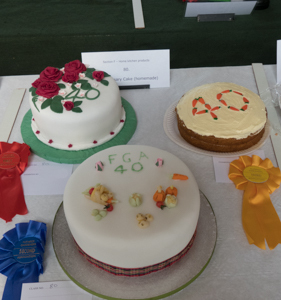 Once again I owe a huge thanks to all those that helped in whatever capacity and to those who entered exhibits (and even greater thanks to those crazy people that did both) it made the day such a success and a great advert for the FGA.